First up, let's have a look at this SANA Namerakahonpo Moist Sheet Mask. Packed like your usual wet tissue packaging, this is actually a pack of mask sheets! You know those facial mask sheets that are individually packed? Yes you're right, this is a similar one just that this time round, 32 sheets are packed in this pack. 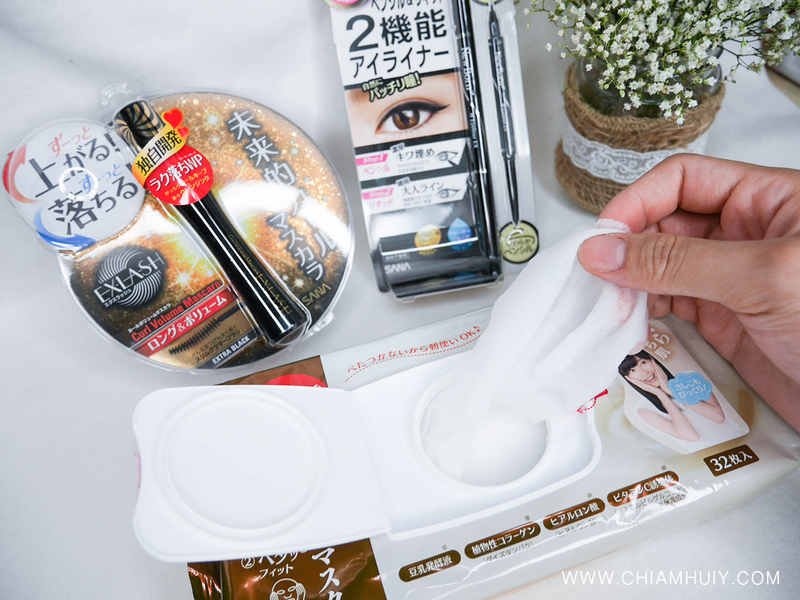 SANA Namerakahonpo Moist Sheet Mask are packed in such a way so that you can easily take one facial mask sheet out and apply it onto your face within as short as 5 seconds. 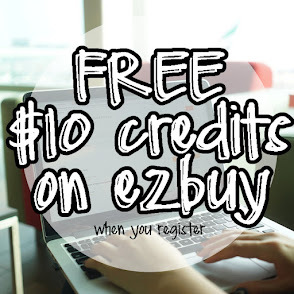 It's really all about convenience for those busy goers, and it's very easy to apply on! In fact, check out how WELL this facial mask sheet can be stretched! 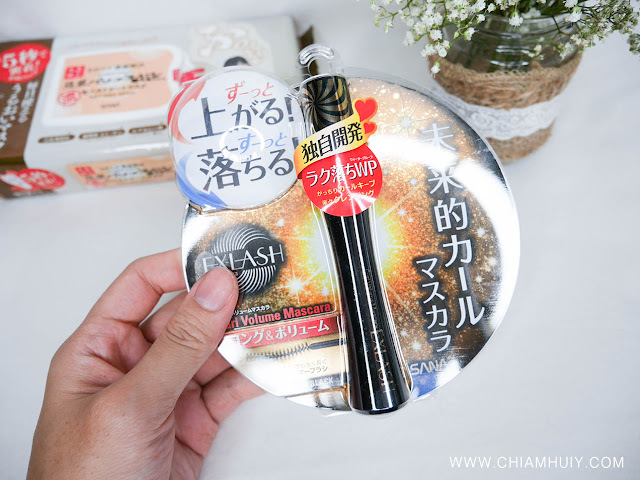 Not only is SANA Namerakahonpo Moist Sheet Mask extremely stretchable, it is also very easy to apply and it somehow attaches to my skin pretty well, which means it doesn't really fall off as easily as other sheet masks I apply. In case you are afraid of the loss of moisture, do not worry as there's a canister type lid to keep your facial mask sheets from evaporating. Studies also found out that SANA Namerakahonpo Moist Sheet Mask is 0.28mm thick, which is thicker to other sheet masks of 0.20mm thickness on average. Moving on to the eyes, we have SANA EX-Lash Curl & Volume Mascara. Made of extra fine and lightweight fiber and volume wax, this mascara has the ability to curl very well and keep your lashes long and volumised. Basically, this mascara contains curl fixed polymer, which coats your eyelashes entirely and creates volumised lashes. I have really short lashes so I seldom use mascara. 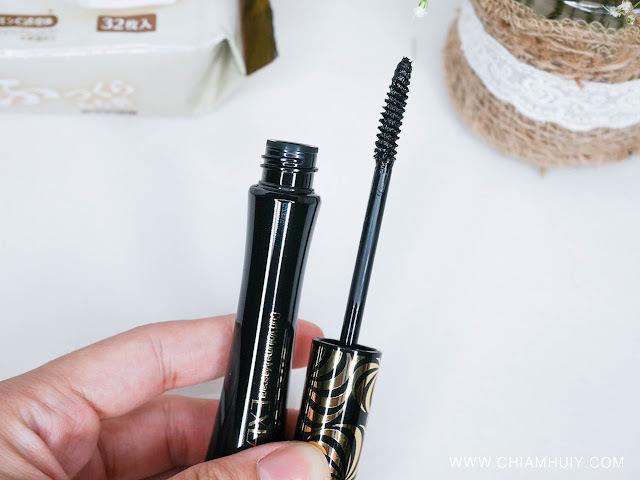 Nonetheless, I still give this a try and find that the mascara texture is pretty thick, which can give a very big eyes look for those blessed with long lashes. I have to however warn that too much coating may result is 'cockroaches-legs' lashes so use sparingly for long, clean lashes! I also like that the thick textured mascara helps to hold my short lashes up. As for removal, this mascara definitely doesn't budge if using micellar makeup remover. But to my surprise, it was easily removed using oil remover! 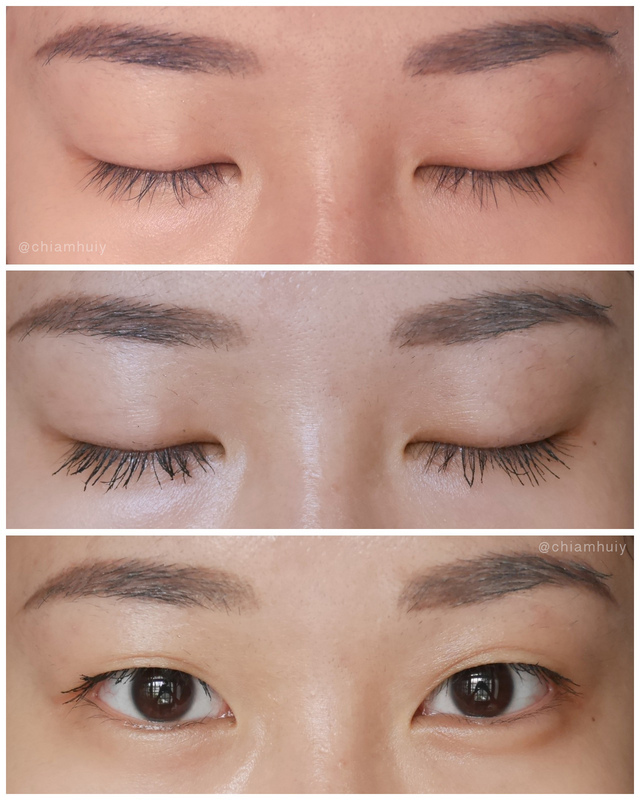 I am pretty pleased with the removing part because I always hated how mascara can stay on despite how good an oil remover is, so SANA EX-Lash Curl & Volume Mascara has passed my test! Before I show you the before and after photo using SANA EX-Lash Curl & Volume Mascara, let's also have a look at SANA New Born Eyeliner too. 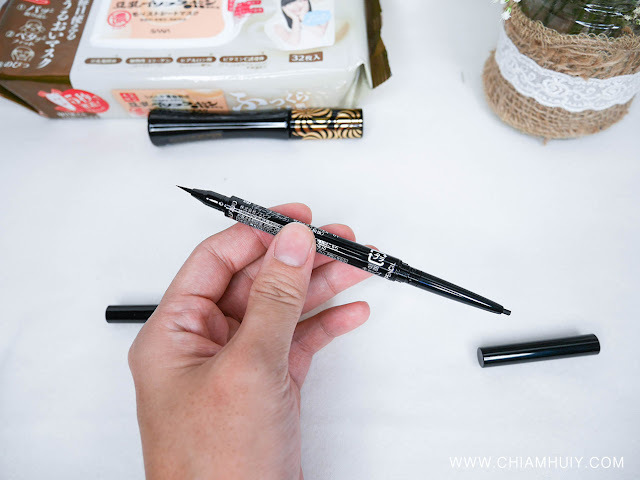 If you can never decide which is better - liquid eyeliner or pencil eyeliner, then this will be your solution - let's have both! As pictured, SANA New Born Eyeliner comes with two different ends, one being liquid eyeliner and the other pencil eyeliner. For a big eye look, people usually line the outer one-third of their bottom waterline. However, waterline are usually lined using pencil eyeliner because liquid eyeliner looks too harsh on waterline, plus it'll smudged. 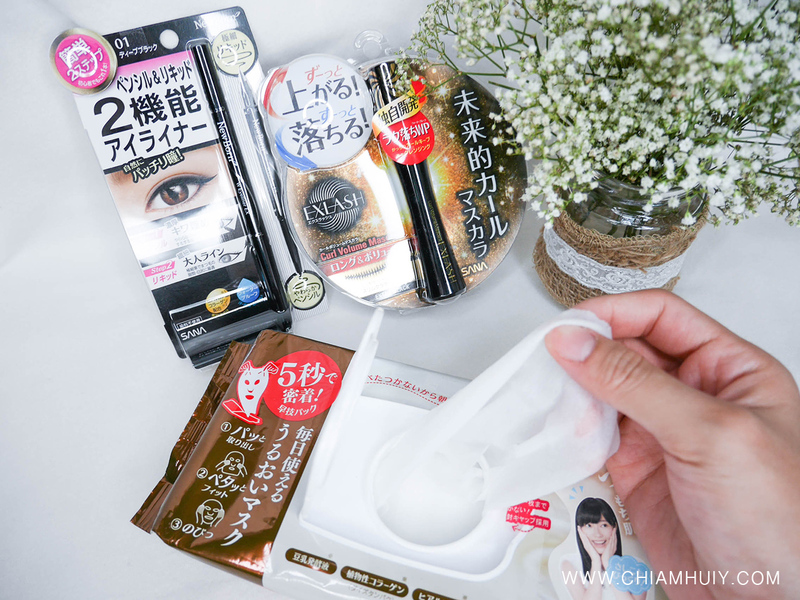 As for the upper eyelid, I usually prefer liquid eyeliner! Which is why, this SANA New Born Eyeliner is made perfect for me. TIP: If you have oily eyelids, using pencil eyeliner to line your upper lids to act as a base will allow the next step (liquid eyeliner) to last longer, and let it look more intense and darker. Which means, line using pencil eyeliner then liquid eyeliner. Both eyeliners work well and doesn't really smudge upon rubbing. 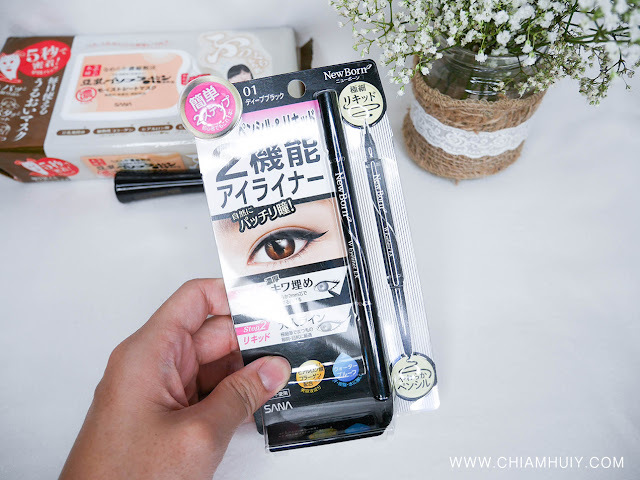 Under the water test, SANA New Born Eyeliner pencil part works TERRIFIC! It doesn't smudge/move at all despite me rubbing it after putting my hand under running water. The liquid eyeliner part does seem to give in a little. And here's some photos using the mascara and eyeliner! I hardly line my bottom waterline so it's quite fun to experiment these looks too! 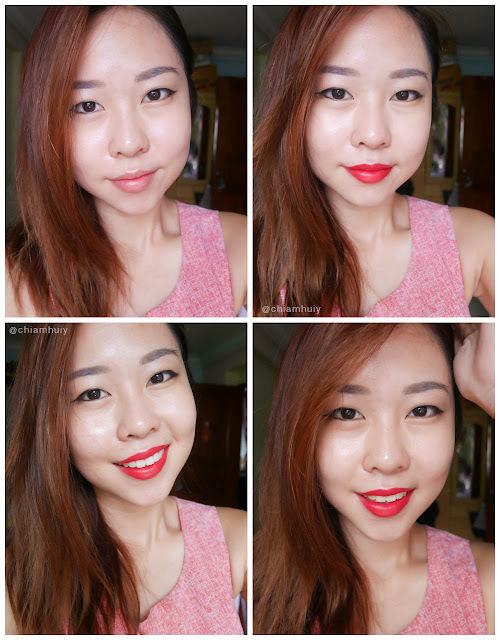 I thought the eye look was pretty seductive so I paired it with red bold lips.